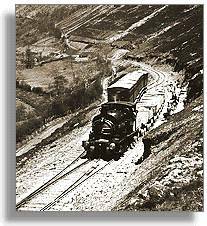 Before the work on the building of the system of dams in the Elan and Claerwen valleys could start, it was necessary to build a large private steam railway system. This was needed to carry the heavy and bulky supplies of stone, cement and timber over the huge area of the two valleys. The Elan Valley Railway was connected to the main Cambrian Railway network near Rhayader station. Work on the railway started in October 1893, and as soon as the railway line reached a dam site, then work could begin on the foundations of that particular dam. The line was extended to the site of the farthest dam at Craig Goch by July 1896. There is a map showing this line on another page. The building of this last section of the track was held up for months because the route was blocked by solid rock. 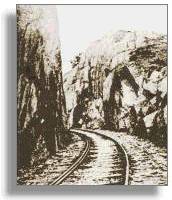 The navvies working on the line called this 'Devil's Gulch', and it looked very similar to the narrow passes through the rocks which were used for ambushes in many Wild West stories ! You can imagine from this old photograph how difficult it would have been to cut a route through the rock using explosives and picks and shovels ! The dam builders had some steam-driven machines, but they were too early to have the use of JCB's ! Today you can walk along the route of the old railway alongside the Pen-y-Garreg Reservoir. The pathway goes through through the Devil's Gulch, which is marked on this recent photograph of the reservoir. But watch out for ambushes !